I asked a number of industry experts to share their predictions for the domain investing business in 2013, and Thies Lindenthal was kind enough to offer a thorough prediction for the business. If you don’t know of Thies, he researches domain prices at Sedo.com and at MIT’s Center for Real Estate. He has developed IDNX, the leading price index for Internet domain names. No doubt, the release of almost unlimited new domain space is the defining topic for domain markets in 2013/2014. Google provides fascinating data on search trends, revealing what we are interested in collectively: The interest over time in search terms like “Internet Domain Names” or “Buy Domain Names” is declining year after year. The new generic Top Level Domains (“new gTLD”), however, moved into the spotlight recently. When people collect information on domains, they more and more look for the new space, not so much the well-established extensions. Comparing search trends for selected keywords is a very ad-hoc approach but it clearly shows that new gTLDs catch attention while domains in general face reduced interest. Do domain investors share this general view? Does the plethora of new TLDs launching next year already cast a shadow on domain prices today? This year’s market data show that the new TLDs play a smaller role than most observers expect. How did prices for domains change in the last 12 months? My Internet Domain Name Index IDNX tracks the prices for domains paid a secondary markets. It is based on several hundred thousand sales of domains and uses estimation techniques similar to those championed by leading house price indices like the Case/Shiller house price index. The IDNX shows that we had it all in 2012: Spring brought rapid growth in values with prices climbing to all-time record highs in March/April, before markets stagnated and lost previous gains in the second half of the year. The total return from January 1st through November 30th is +2.3 percent. In sum, capital gains on domain investments were positive — but far from thrilling. The primary markets kept their momentum as well. Versign reports a robust growth of 12 percent in total registered domains in the last 12 months, with most growth coming from “emerging” country specific extensions. What are domain investors’ expectations for 2013? Basic economics predicts that a boost in supply combined with constant demand will result in lower prices. Why buy a domain from an investor if more “fresh” domains will flood the market? If that frequently aired concern was true, we would already see the effect of the new extensions today. The theory of efficient markets (weak form) states that publicly available information is directly incorporated in prices. Since it is certain that ICANN will roll out the new extensions in 2013, give or take a few months, prices should have adjusted accordingly. IDNX, however, does not shows any massive decline. Why? Are domain markets not efficient? Do domain investors do not update their prices when learning about new developments? My research shows that domainers constantly refresh their domain valuations. 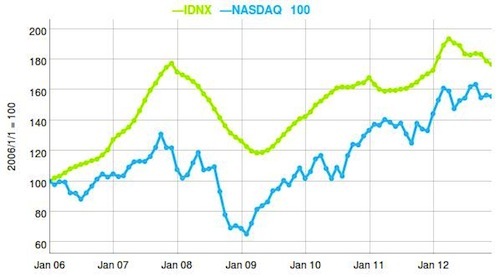 The graph below visualizes that domain prices (green line) move in line with prices for IT shares measured by the NASDAQ 100 index (blue line). Just by looking at this year’s return, it is safe to conclude that the market does not anticipate major losses. Apparently, the new domains are not seen as a mere replacement for existing addresses. The market consensus seems to be that the new gTLDs are rather an addition to the domain space and not so much a threat cannibalizing existing domain holdings. Overall, traders believe that good “virtual locations” will keep their value. A 3 letter .com (or .co?) is believed to shine on in 2013. This concept doesn’t hold true where the ‘goods’ at issue aren’t commodities; unique assets, like quality dot-coms, or high-end artwork, don’t fall into the ‘commodity’ bucket. Gene, true, that is very likely the reason why the quality dot-coms are keeping their value. The new gTLD domains apparently are not seen as a replacement. The new supply is not the same kind of goods as the existing.